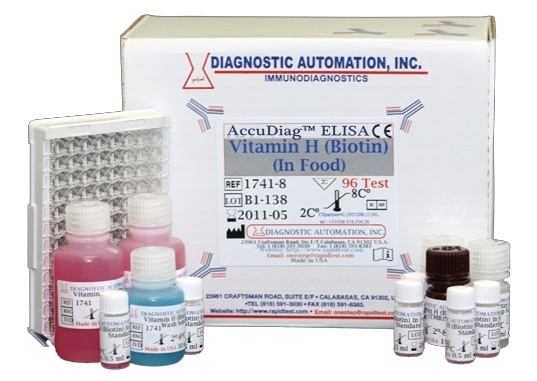 Vitamin H (Biotin) in food ELISA test kit is an Enzyme Immunoassay for the quantitative determination of Biotin (Vitamin H) in Food. Biotin (Vitamin H) serves as the prosthetic group of enzymes, which catalyze carboxylations in the organism. For this purpose, biotin is bound via its carboxy group to lysin residues of carboxylases, and the transfer of carbon dioxide takes place after its attachment to a nitrogen atom of biotin, forming the so-called active carbon dioxide. The awareness of the population for a good health and its interest in healthy nutrition has increased significantly during the last years. After the content of vitamins in his nourishment has gained importance for the consumer, food has partially been vitaminized by the manufacturer. When there exists a lack of biotin, seborrhoea, dermatitis, anorexia, muscle pain, tiredness and nervous disorders can appear. As biotin is synthesized by the human intestinal flora, deficiency symptoms are rare, appear however after excessive ingestion of raw egg white, which can be explained by its content of biotinbinding avidin. The Diagnostic Automation Biotin (Vitamin H) quantitative test is based on the principle of the enzyme linked immunosorbent assay. Avidin, which shows a high affinity to biotin, is bound on the surface of a microtiter plate.